There are many ways a business can go about generating leads. However, there are also some lead generation mistakes that can slow your progress or your ability to gain leads. The main thing to remember when working on your lead generation strategy is that you are trying to gain qualified leads that will eventually turn into customers. The biggest waste of your time is to try to cultivate leads you’ve generated that are never going to go anywhere. So your first job is to figure out how you’ll reach your target audience. 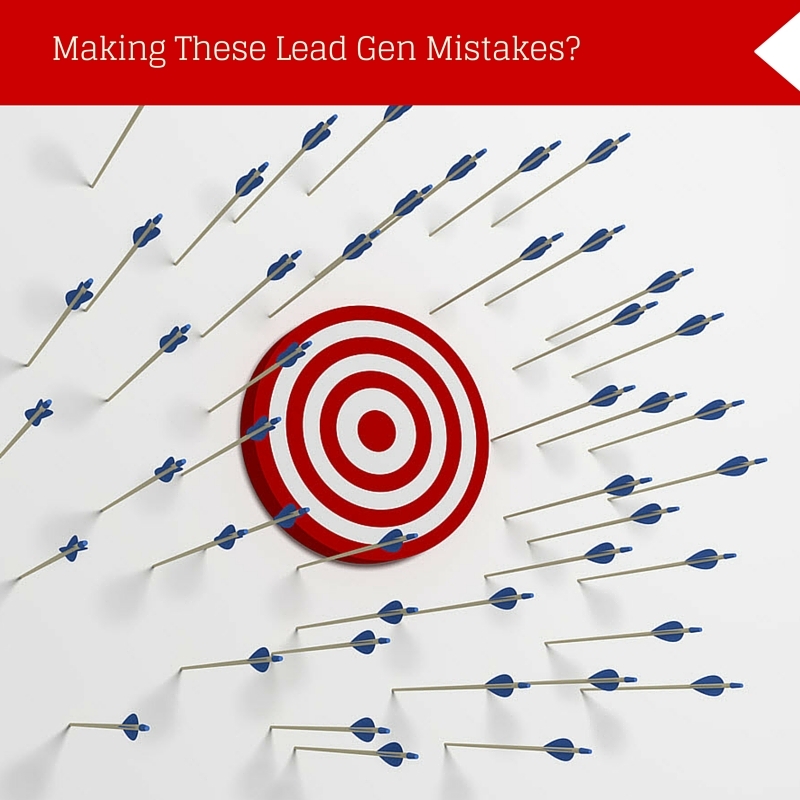 In doing so, there are some key lead generation mistakes you’ll want to avoid. One of the biggest lead generation mistakes you can make is to destroy your followers’ trust. An easy way to do this is by over promoting your business instead of providing quality content your potential customers can use. No one wants to feel like they are constantly being offered a sales pitch. Your content should educate or inspire your audience without shoving a sales pitch down their throat every time they hear from you. That doesn’t mean you can’t add a call to action at the end of the content, but make sure you offer value within the content itself. In the newsletter below, you can see the content shown on the left, which gives detailed, step-by-step instructions on how to use LinkedIn Sales Navigator. On the right, is a pitch for attending their social media marketing event. I don’t mind promotions in email newsletters, as long as I’m also getting good content I can learn from. On the other hand, here is an example of a company that does nothing but send sales pitches. 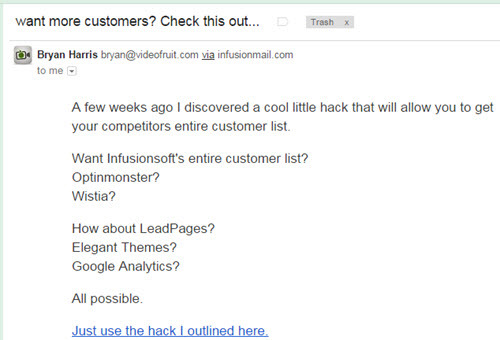 I had signed up for his lead generation ebook, which was a topic I was interested in (I was a qualified lead). Since receiving that ebook, he’s sent several “sales pitch” emails every few days. So instead of nurturing his leads with even more great content, he sales pitched us to death! Guess what I did next? Unsubscribed from his list. Here’s another way to erode trust. Have you ever clicked on a title that ends with, “You won’t BELIEVE what happened next!”? I’ve done it several times while scrolling down my Facebook news feed. There is actually a term for this, and it’s called “click-bait”. Click-bait hides promotional content behind a great headline that everyone wants to click. Once you arrive at the landing page, you find very little of what the title promised, and a whole lot of promotional content. Your goal should be optimizing your website for engagement from your audience, not just getting clicks. Spamming your audience with information that simply isn’t relevant or content that doesn’t offer them anything of value is a sure-fire way to destroy their trust. Much like in your personal life, once trust is destroyed, it takes a long time and a lot of work to rebuild it. Another major mistake marketers make with lead generation is being afraid to fail. Maybe you tried an email campaign that was a major flop. You got nothing out of it and you wasted your precious time and money for nothing. What most of us want to do at that point is to give up and move on. But I suggest you take another approach. Start by looking at every piece of the campaign and analyze why it didn’t work. There could have been one small element, like the headline or call to action that didn’t come together like you needed it to and ruined the whole thing. A good marketer knows the best thing to do is to tweak it and try again. Ultimately some of these strategies are not going to work. If you let the fear of failure creep in, there’s a chance you won’t try, or won’t give it 100%. Redefine what success means to you. Success is trying and giving it your all. Don’t let a certain number or conversion percentage dictate whether or not you succeeded. If you do this, your fear of failure has the ability to ruin things before they even get off the ground. You’ve heard it talked about, or maybe you’ve seen it first-hand. A marketer collects all kinds of leads and then complains that they never convert to sales. One of the main reasons is a lack of follow through. It is easy to get the information, especially for well-qualified leads, but it takes more than just getting them as a lead to convert them to a customer. It’s like the old saying goes; you can lead a horse to water, but you can’t make them drink. Except that it’s your job to make them drink. You just need to do a better job of enticing them, nurturing them, and giving them what they’re looking for — and there is plenty of software out there that can help you. Email services like Aweber offer autoresponders that you can use to nurture your new leads. If your lead generation tool is a series of lessons, then you can set up the autoresponders to automatically go out to each of your leads on a set schedule. That is automated follow through at its best because you set it up once and you’re done! That is, unless you’re not getting the results you’re looking for in converted leads. That’s when tweaking your messages comes into play. Conferences and networking events are another example of marketing without follow through. How many times do you go to networking events, have great conversations, exchange business cards and then never connect with that person again? This happens all the time. Instead of simply collecting their cards, make them work for you. These are not just leads, they are warm leads. You’ve already had your initial conversation, now you need to nurture it. Make that horse drink. As soon as you get home from your event, go to your social media sites and connect with them. People you just met will remember you and are certain to accept your invitation to connect online. If you don’t do this simple follow up, chances are you won’t see them again for several weeks or months, and they may have forgotten all about you by then. But if you stay top of mind, you are more-than-likely going to convert that warm lead into a sale, or perhaps even get a referral from them. After all, not everyone you meet at a networking event is going to be your ideal client, but they may know a few who are. The easiest lead generation mistake to make is not knowing your target audience. That’s because many small business owners think that everyone needs their product or service. I work with a lot of residential cleaning business owners and many of them think that anyone who owns a home is a prospect. I beg to differ because I see time and time again, some of these same business owners complain because their “lead” wants them to adjust their price lower. When you allow your prospects to dictate your price, you’re targeting the wrong target audience. Knowing your target audience is where it all starts. If you can’t pinpoint who it is you should be marketing to, then you will ultimately fail at every attempt you make. It goes back to the basics. You can’t create quality content if you don’t understand who you are writing for, and you can’t convert leads when you target the wrong audience. Would you like to learn more about how to narrow down your target audience so you can generate more qualified leads? Sign up for our Free Trial of the Duct Tape Marketing System Video Training. The first two lessons are FREE for 2 Weeks!